Cleaning out my files and I found this document compiled by my friend Ginger Taylor. 30 studies that show a link between vaccines and autism. 30. 30. DO YOU UNDERSTAND? What you hear on TV, from the CDC, the IOM, the AAP and the NIH is nothing more than eisegesis. You want to know the real kicker? There are 49, I couldn’t fit them all in the note character range (on Facebook). It is an often repeated fallacy that there is no research that supports the supposition that vaccines can cause autism. This talking point is most often repeated by medical personnel and public health officials who have simply never been told that these studies exist, and in some cases by those who refuse to read the information when it is offered to them, so they continue to labor under the false assumption that vaccine autism causation is merely an “internet rumor” or a result of one paper that was published in 1998. In fact, the first research paper to offer evidence that vaccines may cause autism was THE first paper ever written on autism. In the 1930’s, Child Psychiatrist Leo Kanner discovered 11 children over the course of several years who displayed a novel set of neurological symptoms that had never been described in the medical literature, where children were withdrawn, uncommunicative and displayed similar odd behaviors. This disorder would become known as “autism.” In the paper, Dr. Kanner noted that onset of the disorder began following the administration of a small pox vaccine. This paper, was published in 1943, and evidence that vaccination causes an ever increasing rate of neurological and immunological regressions, including autism, has been mounting from that time until now. All of Kanners cases were born after, and began to appear following, the introduction of Eli Lilly’s new form of water soluble mercury in the late 1920s used as an anti-fungal in forestry, a wood treatment product in the lumber industry and as a disinfectant and anti-bacterial in the medical industry under the name of “Thimerosal” that was included in vaccines. As I testified to at the hearing, there is abundant research supporting the vaccine autism link. I have included 49 research papers for your review, and only included research published in the last ten years or so. This is by no means a complete list, but it one that I have been compiling for the last few years as relevant research came to my attention. I have ONLY included autism related information, not research on other vaccine injuries of which there are many. As you can see, the medical professionals testifying that there is no scientific support for the vaccine/autism causation theory are uninformed about the current state of the science. When vaccination decisions are made based on an uninformed opinion, it means serious potential damage to the patient, and because of the law preventing lawsuits for vaccine injury, it also means that the uninformed medical professionals making bad recommendations CANNOT be held accountable in any way for giving the patient bad information. Parents want to know if their child can develop autism from their vaccines. If they believe that the answer is yes, and the risk of brain injury from vaccination is higher than their risk from a disease, it is their right to decline vaccination for themselves and their children with out coercion. Patients MUST be able to make their own informed vaccine decisions, because often, they know more about potential vaccine risks that even top public health officials do. hepatitis B vaccination and ear infection, pharyngitis, and chronic arthritis; as well as receipt of early intervention/special education services (EIS); in probability samples of U.S. children. Children with autistic spectrum disorder (ASD) comprise a growing caseload for EIS. We evaluated the association between hepatitis B vaccination of male neonates and parental report of ASD. METHODS: This cross-sectional study used U.S. probability samples obtained from National Health Interview Survey 1997-2002 datasets. Logistic regression modeling was used to estimate the effect of neonatal hepatitis B vaccination on ASD risk among boys age 3-17 years with shot records, adjusted for race, maternal education, and two-parent household. compared to later- or unvaccinated boys. Non-Hispanic white boys were 61% less likely to have ASD (ORZ0.39; pZ0.04; 95% CIZ0.16, 0.94) relative to non-white boys. CONCLUSION: Findings suggest that U.S. male neonates vaccinated with hepatitis B vaccine had a 3-fold greater risk of ASD; risk was greatest for non-white boys. This new study from France utilizes a new and sophisticated measurement for environmental toxicity by assessing porphyrin levels in autistic children. It provides clear and unequivocal evidence that children with autism spectrum disorders are more toxic than their neurotypical peers. Abstract: To address a possible environmental contribution to autism, we carried out a retrospective study on urinary porphyrin levels, a biomarker of environmental toxicity, in 269 children with neurodevelopmental and related disorders referred to a Paris clinic (2002–2004), including 106 with autistic disorder. Urinary porphyrin levels determined by high-performance liquid chromatography were compared between diagnostic groups including internal and external control groups. Coproporphyrin levels were elevated in children with autistic disorder relative to control groups. Elevation was maintained on normalization for age or to a control heme pathway metabolite (uroporphyrin) in the same samples. The elevation was significant (P < 0.001). Porphyrin levels were unchanged in Asperger’s disorder, distinguishing it from autistic disorder. The atypical molecule precoproporphyrin, a specific indicator of heavy metal toxicity, was also elevated in autistic disorder (P < 0.001) but not significantly in Asperger’s. A subgroup with autistic disorder was treated with oral dimercaptosuccinic acid (DMSA) with a view to heavy metal removal. Following DMSA there was a significant (P = 0.002) drop in urinary porphyrin excretion. These data implicate environmental toxicity in childhood autistic disorder. Autism, a member of the pervasive developmental disorders (PDDs), has been increasing dramatically since its description by Leo Kanner in 1943. 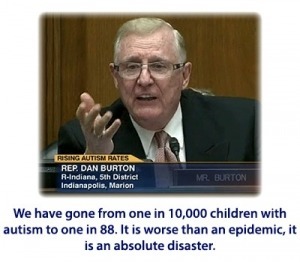 First estimated to occur in 4 to 5 per 10,000 children, the incidence of autism is now 1 per 110 in the United States, and 1 per 64 in the United Kingdom, with similar incidences throughout the world. Searching information from 1943 to the present in PubMed and Ovid Medline databases, this review summarizes results that correlate the timing of changes in incidence with environmental changes. Autism could result from more than one cause, with different manifestations in different individuals that share common symptoms. Documented causes of autism include genetic mutations and/or deletions, viral infections, and encephalitis following vaccination. Therefore, autism is the result of genetic defects and/or inflammation of the brain. The inflammation could be caused by a defective placenta, immature blood-brain barrier, the immune response of the mother to infection while pregnant, a premature birth, encephalitis in the child after birth, or a toxic environment. Environmental Health Perspectives, July 2006. This study demonstrates that very low-levels of Thimerosal can contribute to immune system disregulation. 5. Gender-selective toxicity of thimerosal. Exp Toxicol Pathol. 2009 Mar;61(2):133-6. Epub 2008 Sep 3. Branch DR, Departments of Medicine and Laboratory Medicine and Pathobiology, University of Toronto, Ontario, Canada. A recent report shows a correlation of the historical use of thimerosal in therapeutic immunizations with the subsequent development of autism; however, this association remains controversial. Autism occurs approximately four times more frequently in males compared to females; thus, studies of thimerosal toxicity should take into consideration gender-selective effects. The present study was originally undertaken to determine the maximum tolerated dose (MTD) of thimersosal in male and female CD1 mice. However, during the limited MTD studies, it became apparent that thimerosal has a differential MTD that depends on whether the mouse is male or female. At doses of 38.4-76.8mg/kg using 10% DMSO as diluent, seven of seven male mice compared to zero of seven female mice tested succumbed to thimerosal. Although the thimerosal levels used were very high, as we were originally only trying to determine MTD, it was completely unexpected to observe a difference of the MTD between male and female mice. Thus, our studies, although not directly addressing the controversy surrounding thimerosal and autism, and still preliminary due to small numbers of mice examined, provide, nevertheless, the first report of gender-selective toxicity of thimerosal and indicate that any future studies of thimerosal toxicity should take into consideration gender-specific differences. Environmental Health Perspectives, Aug 2005. Thomas Burbacher, PhD [University of Washington]. This study demonstrates clearly and unequivocally that ethyl mercury, the kind of mercury found in vaccines, not only ends up in the brain, but leaves double the amount of inorganic mercury as methyl mercury, the kind of mercury found in fish. This work is groundbreaking because little is known about ethyl mercury, and many health authorities have asserted that the mercury found in vaccines is the “safe kind.” This study also delivers a strong rebuke of the Institute of Medicine’s recommendation in 2004 to no longer pursue the mercury-autism connection. 7. Increases in the number of reactive glia in the visual cortex of Macaca fascicularis following subclinical long-term methyl mercury exposure. The number of neurons, astrocytes, reactive glia, oligodendrocytes, endothelia, and pericytes in the cortex of the calcarine sulcus of adult female Macaca fascicularis following long-term subclinical exposure to methyl mercury (MeHg) and mercuric chloride (inorganic mercury; IHg) has been estimated by use of the optical volume fractionator stereology technique. Four groups of monkeys were exposed to MeHg (50 micrograms Hg/kg body wt/day) by mouth for 6, 12, 18, and 12 months followed by 6 months without exposure (clearance group). A fifth group of monkeys was administered IHg (as HgCl2; 200 micrograms Hg/kg body wt/day) by constant rate intravenous infusion via an indwelling catheter for 3 months. Reactive glia showed a significant increase in number for every treatment group, increasing 72% in the 6-month, 152% in the 12-month, and 120% in the 18-month MeHg exposed groups, and the number of reactive glia in the clearance group remained elevated (89%). The IHg exposed group showed a 165% increase in the number of reactive glia. The IHg exposed group and the clearance group had low levels of MeHg present within the tissue; however, the level of IHg was elevated in both groups. These results suggest that the IHg may be responsible for the increase in reactive glia. All other cell types, including the neurons, showed no significant change in number at the prescribed exposure level and durations. The identities of the reactive glial cells and the implications for the long-term function and survivability of the neurons due to changes in the glial population following subclinical long-term exposure to mercury are discussed. Annals of Neurology, Feb 2005. Diana L. Vargas, MD [Johns Hopkins University]. This study, performed independently and using a different methodology than Dr. Herbert (see above) reached the same conclusion: the brains of autistic children are suffering from inflammation. 9. Autism: A Brain Disorder, or A Disorder That Affects the Brain? Autism is defined behaviorally, as a syndrome of abnormalities involving language, social reciprocity and hyperfocus or reduced behavioral flexibility. It is clearly heterogeneous, and it can be accompanied by unusual talents as well as by impairments, but its underlying biological and genetic basis in unknown. Autism has been modeled as a brain-based, strongly genetic disorder, but emerging findings and hypotheses support a broader model of the condition as a genetically influenced and systemic. These include imaging, neuropathology and psychological evidence of pervasive (and not just specific) brain and phenotypic features; postnatal evolution and chronic persistence of brain, behavior and tissue changes (e.g. inflammation) and physical illness symptomatology (e.g. gastrointestinal, immune, recurrent infection); overlap with other disorders; and reports of rate increases and improvement or recovery that support a role for modulation of the condition by environmental factors (e.g. exacerbation or triggering by toxins, infectious agents, or others stressors, or improvement by treatment). Modeling autism more broadly encompasses previous work, but also encourages the expansion of research and treatment to include intermediary domains of molecular and cellular mechanisms, as well as chronic tissue, metabolic and somatic changes previously addressed only to a limited degree. The heterogeneous biologies underlying autism may conceivably converge onto the autism profile via multiple mechanisms on the one hand and processing and connectivity abnormalities on the other may illuminate relevant final common pathways and contribute to focusing on the search for treatment targets in this biologically and etiologically heterogeneous behavioral syndrome. Richard C. Deth, PhD [Northeastern University]. Objective To validate parental report of autistic regression using behavioral data coded from home videotapes of children with autism spectrum disorder (ASD) vs typical development taken at 12 and 24 months of age. Design Home videotapes of 56 children’s first and second birthday parties were collected from parents of young children with ASD with and without a reported history of regression and typically developing children. Child behaviors were coded by raters blind to child diagnosis and regression history. A parent interview that elicited information about parents’ recall of early symptoms from birth was also administered. Setting Participants were recruited from a multidisciplinary study of autism conducted at a major university. Participants Fifteen children with ASD with a history of regression, 21 children with ASD with early-onset autism, and 20 typically developing children and their parents participated. Main Outcome Measures Observations of children’s communicative, social, affective, repetitive behaviors, and toy play coded from videotapes of the toddlers’ first and second birthday parties. Results Analyses revealed that infants with ASD with regression show similar use of joint attention and more frequent use of words and babble compared with typical infants at 12 months of age. In contrast, infants with ASD with early onset of symptoms and no regression displayed fewer joint attention and communicative behaviors at 12 months of age. By 24 months of age, both groups of toddlers with ASD displayed fewer instances of word use, vocalizations, declarative pointing, social gaze, and orienting to name as compared with typically developing 24-month-olds. Parent interview data suggested that some children with regression displayed difficulties in regulatory behavior before the regression occurred. Conclusion This study validates the existence of early autistic regression. UPDATE: Since the Poling Case, this has become a popular link, so I will update it with more research and better information so that you can actually find and read the articles. Below is a partial list that I will keep adding to. The question of what is leading to the apparent increase in autism is of great importance. Like the link between aspirin and heart attack, even a small effect can have major health implications. If there is any link between autism and mercury, it is absolutely crucial that the first reports of the question are not falsely stating that no link occurs. We have reanalyzed the data set originally reported by Ip et al. in 2004 and have found that the original p value was in error and that a significant relation does exist between the blood levels of mercury and diagnosis of an autism spectrum disorder. Moreover, the hair sample analysis results offer some support for the idea that persons with autism may be less efficient and more variable at eliminating mercury from the blood. This article showed that 38% of Kennedy Krieger Institute autism patients studied had one marker for impaired oxidative phosphorylation (mitochondrial dysfunction), and 47% had a second marker. Shows a potential link between mercury and the autopsied brains of young people with autism. A marker for oxidative stress was 68.9% higher in autistic brain issue than controls (a statistically significant result), while mercury levels were 68.2% higher. The Neuroscientist, Volume 11, Number 5, 2005. This study helps refute the notion that the brains of autistic children are simply wired differently and notes, “neuroinflammation appears to be present in autistic brain tissue from childhood through adulthood.” Dr. Herbert suggests that chronic disease or an external environmental source (like heavy metals) may be causing the inflammation. The most replicated finding in autism neuroanatomy—a tendency to unusually large brains—has seemed paradoxical in relation to the specificity of the abnormalities in three behavioral domains that define autism. We now know a range of things about this phenomenon, including that brains in autism have a growth spurt shortly after birth and then slow in growth a few short years afterward, that only younger but not older brains are larger in autism than in controls, that white matter contributes disproportionately to this volume increase and in a nonuniform pattern suggesting postnatal pathology, that functional connectivity among regions of autistic brains is diminished, and that neuroinflammation (including microgliosis and astrogliosis) appears to be present in autistic brain tissue from childhood through adulthood. Alongside these pervasive brain tissue and functional abnormalities, there have arisen theories of pervasive or widespread neural information processing or signal coordination abnormalities (such as weak central coherence, impaired complex processing, and underconnectivity), which are argued to underlie the specific observable behavioral features of autism. This convergence of findings and models suggests that a systems- and chronic disease–based reformulation of function and pathophysiology in autism needs to be considered, and it opens the possibility for new treatment targets. Journal of Toxicology and Environmental Health, Nov-Dec 2006.
stress is covered and the possible involvement of glutathione is discussed. Finally, the article discusses what may be happening over the course of development and the multiple factors that may interplay and make these children more vulnerable to toxicity, oxidative stress, and neuronal insult. This study provides a helpful overview of the growing evidence supporting the link between oxidative stress and autism. S. Jill James, PhD [University of Arkansas]. This recent study demonstrates that Thimerosal lowers or inhibits the body’s ability to produce Glutathione, an antioxidant and the body’s primary cellular-level defense against mercury. This study demonstrates the extreme toxicity of the aluminum adjuvant used as a preservative in vaccines. Excerpt: “testing showed motor deficits in the aluminum treatment group that expressed as a progressive decrease in strength measured…Significant cognitive deficits in water-maze learning were observed in the combined aluminum and squalene group…Apoptotic neurons were identified in aluminum-injected animals that showed significantly increased activated caspase-3 labeling in lumbar spinal cord (255%) and primary motor cortex (192%) compared with the controls. Aluminum-treated groups also showed significant motor neuron loss (35%) and increased numbers of astrocytes (350%) in the lumbar spinal cord. This study demonstrated the correlation between environmental mercury and autism rates in Texas. 284 ASD children & 657 controls, born in 1994 in Bay Area, were assigned exposure levels by birth tract for 19 chemicals. Risks for autism were elevated by 50% in tracts with the highest chlorinated solvents and heavy metals. The highest risk compounds were mercury, cadmium, nickel, trichloroethylene, and vinyl chloride, and the risk from heavy metals was almost twice as high as solvents. This study reviewed the case histories and medical profiles of nine autistic children and concluded that eight of the nine children were mercury toxic and this toxicity manifested itself in a manner consistent with Autism Spectrum Disorders. Impairments in social relatedness and communication, repetitive behaviors, and stereotypic abnormal movement patterns characterize autism spectrum disorders (ASDs). It is clear that while genetic factors are important to the pathogenesis of ASDs, mercury exposure can induce immune, sensory, neurological, motor, and behavioral dysfunctions similar to traits defining or associated with ASDs. The Institutional Review Board of the Institute for Chronic Illnesses (Office for Human Research Protections, U.S. Department of Health and Human Services, IRB number IRB00005375) approved the present study. A case series of nine patients who presented to the Genetic Centers of America for a genetic/developmental evaluation are discussed. Eight of nine patients (one patient was found to have an ASD due to Rett’s syndrome) (a) had regressive ASDs; (b) had elevated levels of androgens; (c) excreted significant amounts of mercury post chelation challenge; (d) had biochemical evidence of decreased function in their glutathione pathways; (e) had no known significant mercury exposure except from Thimerosal- containing vaccines/Rho(D)-immune globulin preparations; and (f) had alternate causes for their regressive ASDs ruled out. There was a significant dose-response relationship between the severity of the regressive ASDs observed and the total mercury dose children received from Thimerosal-containing vaccines/Rho (D)- immune globulin preparations. Based upon differential diagnoses, 8 of 9 patients examined were exposed to significant mercury from Thimerosal-containing biologic/vaccine preparations during their fetal/infant developmental periods, and subsequently, between 12 and 24 mo of age, these previously normally developing children suffered mercury toxic encephalopathies that manifested with clinical symptoms consistent with regressive ASDs. Evidence for mercury intoxication should be considered in the differential diagnosis as contributing to some regressive ASDs. Neuropediatrics, August 2006 – P.R. Kong [Department of Pediatrics and Adolescent Medicine, The University of Hong Kong]. This study demonstrates that blood mercury levels are higher for children with ADHD. This study helps to refute the supposition made by some researchers that autism’s epidemic may only be due to “diagnostic substitution”. While evidence points to a multigenic etiology of most autism, the pathophysiology of the disorder has yet to be defined and the underlying genes and biochemical pathways they subserve remain unknown. Autism is considered to be influenced by a combination of various genetic, environmental and immunological factors; more recently, evidence has suggested that increased vulnerability to oxidative stress may be involved in the etiology of this multifactorial disorder. Furthermore, recent studies have pointed to a subset of autism associated with the biochemical endophenotype of mitochondrial energy deficiency, identified as a subtle impairment in fat and carbohydrate oxidation. This phenotype is similar, but more subtle than those seen in classic mitochondrial defects. In some cases the beginnings of the genetic underpinnings of these mitochondrial defects are emerging, such as mild mitochondrial dysfunction and secondary carnitine deficiency observed in the subset of autistic patients with an inverted duplication of chromosome 15q11-q13. In addition, rare cases of familial autism associated with sudden infant death syndrome (SIDS) or associated with abnormalities in cellular calcium homeostasis, such as malignant hyperthermia or cardiac arrhythmia, are beginning to emerge. Such special cases suggest that the pathophysiology of autism may comprise pathways that are directly or indirectly involved in mitochondrial energy production and to further probe this connection three new avenues seem worthy of exploration: 1) metabolomic clinical studies provoking controlled aerobic exercise stress to expand the biochemical phenotype, 2) high-throughput expression arrays to directly survey activity of the genes underlying these biochemical pathways and 3) model systems, either based upon neuronal stem cells or model genetic organisms, to discover novel genetic and environmental inputs into these pathways. insults (e.g., infection). In autism, over-zealous neuroinflammatory responses could not only influence neural developmental processes, but may more significantly impair neural signaling involved in cognition in an ongoing fashion. This model makes specific predictions in patients and experimental animal models and suggests a number of targets sites of intervention. Our model of potentially reversible pathophysiological mechanisms in autism motivates our hope that effective therapies may soon appear on the horizon. Conclusion: Metals are ubiquitous in our environment, and exposure to them is inevitable. However, not all people accumulate toxic levels of metals or exhibit symptoms of metal toxicity, suggesting that genetics play a role in their potential to damage health. Metal toxicity creates multisystem dysfunction, which appears to be mediated primarily through mitochondrial damage from glutathione depletion. Accurate screening can increase the likelihood that patients with potential metal toxicity are identified. The most accurate screening method for assessing chronic-metals exposure and metals load in the body is a provoked urine test. Abstract: Classical mitochondrial diseases occur in a subset of individuals with autism and are usually caused by genetic anomalies or mitochondrial respiratory pathway deficits. However, in many cases of autism, there is evidence of mitochondrial dysfunction (MtD) without the classic features associated with mitochondrial disease. MtD appears to be more common in autism and presents with less severe signs and symptoms. It is not associated with discernable mitochondrial pathology in muscle biopsy specimens despite objective evidence of lowered mitochondrial functioning. Exposure to environmental toxins is the likely etiology for MtD in autism. This dysfunction then contributes to a number of diagnostic symptoms and comorbidities observed in autism including: cognitive impairment, language deficits, abnormal energy metabolism, chronic gastrointestinal problems, abnormalities in fatty acid oxidation, and increased oxidative stress. MtD and oxidative stress may also explain the high male to female ratio found in autism due to increased male vulnerability to these dysfunctions. Biomarkers for mitochondrial dysfunction have been identified, but seem widely under-utilized despite available therapeutic interventions. Nutritional supplementation to decrease oxidative stress along with factors to improve reduced glutathione, as well as hyperbaric oxygen therapy (HBOT) represent supported and rationale approaches. The underlying pathophysiology and autistic symptoms of affected individuals would be expected to either improve or cease worsening once effective treatment for MtD is implemented. This study should be viewed as hypothesis-generating – a first step in examining the potential role of environmental mercury and childhood developmental disorders. Nothing is known about specific exposure routes, dosage, timing, and individual susceptibility. We suspect that persistent low-dose exposures to various environmental toxicants, including mercury, that occur during critical windows of neural development among genetically susceptible children (with a diminished capacity for metabolizing accumulated toxicants) may increase the risk for developmental disorders such as autism. Successfully identifying the specific combination of environmental exposures and genetic susceptibilities can inform the development of targeted prevention intervention strategies. Ana Margarida Coutinho BSc, Instituto Gulbenkian de Ciência, Oeiras; Luísa Mota-Vieira PhD, Unidade de Genética e Patologia moleculares, Hospital do Divino Espírito Santo, Ponta Delgada, Açores; Esmeralda Gonçalves PhD; Nazaré Mendes Lopes PhD, Faculdade de Ciências e Tecnologia, Universidade de Coimbra; Vitor Rodrigues MD PhD; Henrique Carmona da Mota MD PhD, Faculdade de Medicina, Universidade de Coimbra, Coimbra; Astrid Moura Vicente PhD, Instituto Gulbenkian de Ciência, Oeiras, Portugal. Abstract: The objective of this study was to estimate the prevalence of autistic spectrum disorder (ASD) and identify its clinical characterization, and medical conditions in a paediatric population in Portugal. A school survey was conducted in elementary schools, targeting 332 808 school-aged children in the mainland and 10 910 in the Azores islands. Referred children were directly assessed using the Diagnostic and Statistical Manual of Mental Disorders (4th edn), the Autism Diagnostic Interview–Revised, and the Childhood Autism Rating Scale. Clinical history and a laboratory investigation was performed. In parallel, a systematic multi-source search of children known to have autism was carried out in a restricted region. The global prevalence of ASD per 10 000 was 9.2 in mainland, and 15.6 in the Azores, with intriguing regional differences. A diversity of associated medical conditions was documented in 20%, with an unexpectedly high rate of mitochondrial respiratory chain disorders.